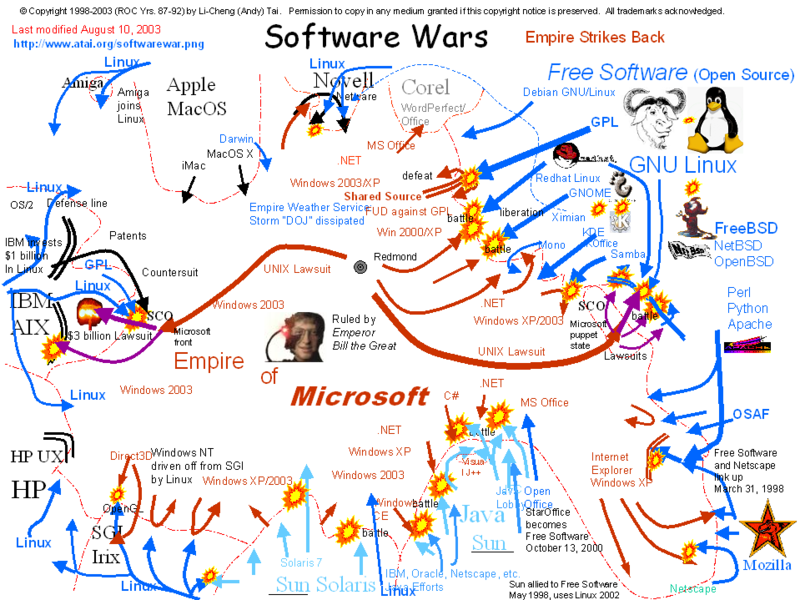 In the following image, lines along with the letters represent companies that Microsoft uses in order to fight the threats which these lines link to. This was put together rather quickly, so any corrections and additions would be very welcome. Intriguing! That sums up a lot of the strategy, doesn’t it? Good work. Thanks. I missed a few (realised it moments later), but it was really just a quick minddump spewed onto the GIMP. This was inspired by software wars, but here you have Microsoft using companies (or “sockpuppets”) instead of producing better software to counter threat. It’s a case of outmuscling the rivals instead of showing one’s own muscle. Excellent job, Roy. I’ll make use of it. I believe that another reference that should be created is a ‘credibility page.’ When some promotes a product/service/policy/strategy of m$ at the cost of their own credibility, they should make the list. eg, various research groups have done reports for m$ that were clearly skewed. Add ‘em to the list with a brief abstract about how they’ve distorted the facts to serve Redmond’s purposes. I think this would add to the whole boycott effort/influence. If it becomes a high-profile page, people might think twice to selling out to the Borg. Thanks again for the mindmap. Can you maybe assist or become a maintainer of a static page? I agree, it would be an effective one to have just like Groklaw’s Microsoft Litigation, for example.